Philadelphia, PA (March 10, 2010) - The Environmental Protection Agency's (EPA) "endangerment finding" for greenhouse gases has been the focus of much recent attention as the federal government's approach to climate change regulation continues to evolve. 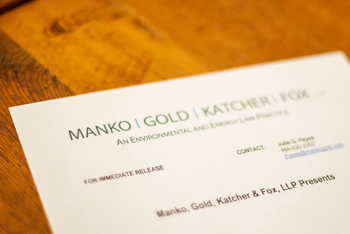 Todd Kantorczyk, a partner with Manko, Gold, Katcher & Fox (MGKF), an environmental and energy law firm, will host a webinar presentation on Thursday, March 18 at 11 a.m. sponsored by The Auditing Roundtable to discuss EPA's endangerment finding and its potential impacts on GHG regulation. The Auditing Roundtable is a national organization whose membership includes over 800 environmental, health, and safety auditing professionals.